Coral Harbour Base, 18 FEB. ‘19 (RBDF): The maritime borders of The Bahamas are challenged by illicit activities that often occur at the same time within different geographical locations around The Bahamas (Photo 1 - Illicit Maritime Activities). To effectively respond to multiple threats including drug, human and weapons smuggling, as well as poaching and natural disasters, the Royal Bahamas Defence Force has been steadily unfolding a comprehensive program to decentralize its operations using a multi-layered security approach within a collaborative framework throughout our family of islands. Short term maritime security measures alone will not work in solving challenges that confront The Bahamas in these changing times. Currently, most of the Defence Force patrol operations originate out of New Providence in the north-central Bahamas. The multi-pronged dentralization program in which the Defence Force is engaged calls for the establishment of bases for a sustained presence at strategic choke points throughout our islands. The program therefore involves the acquisition of ships, dredging of harbours, construction of quaywalls and jetties, expansion and/or construction of bases, the acquisition of detection and tracking technologies, and the strengthening of security cooperation with local and regional partners over the next five years (Photo 2 - Multi-Layered Security Approach). In essence, decentralization' is a long term, sustainable solution that facilitates the implementation of short term measures by the Defence Force in rolling back a diverse number of illicit activities. Additionally, this approach allows the Defence Force to provide necessary assistance to civilian authorities such as police, customs, immigration, the Department of Correctional Services, the National Emergency Management Agemcy and others. Despite changes in the manner in which illicit activities are carried out on the maritime front, the Defence Force's anti-migrant smuggling operations have unilaterally and in association with local and regional partners have apprehended almost 1,200 Haitian nationals last year. Also last year, approximately 200 Dominicans were apprehended by the Defence Force aboard 5 motherships resulting in the award of jail time and approximately $8 million dollars in fines by the courts. The Defence Force had also deployed a number of its Marines to work with the Royal Bahamas Police Force in its crime reduction efforts on our streets throughout the year. The joint effort, which is still underway, yielded a noted reduction in the nation's murder rate--the lowest in a decade. This collaboration also included two major operations in the Family Islands, resulting in arrests of persons wanted by Police or found in possession of weapons, drugs, and other contraband. In addition to extensive disaster relief operations that were carried out at home and abroad (including an overseas mission to the Commonwealth of Dominica) during the period 2015 through 2017, Defence Force troops have provided fulltime security support for the residents of Ragged Island since that island was left devastated by Hurricane Irma in 2017. 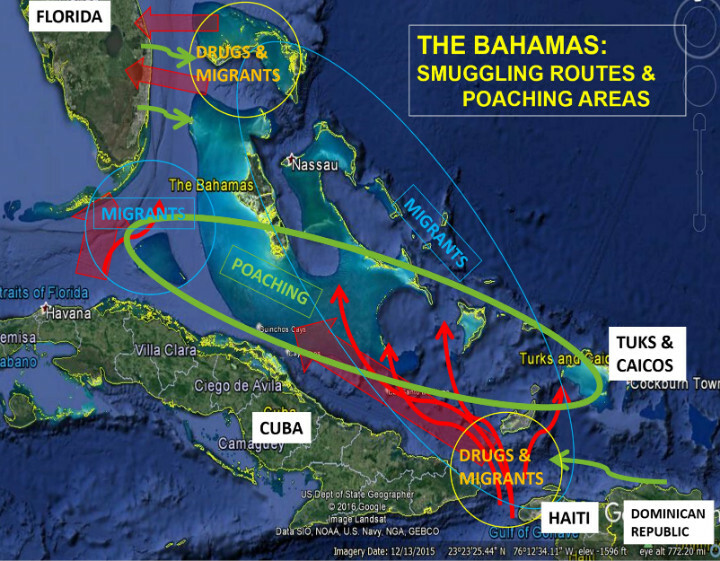 Smuggling of undocumented migrants is a major threat to The Bahamas. Needless to say, times and technologies have changed, so too have trends and patterns that are associated with the age-old problems of human, gun and drug smuggling, along with increased potential for terrorist-related activities. Weather patterns have also changed with an increase in frequency of tropical storms and hurricanes in the region. 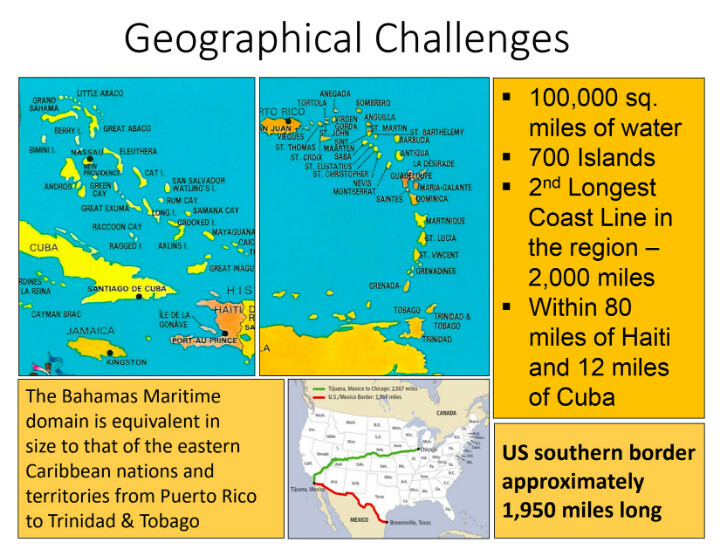 In the case of smuggling of undocumented migrants, there have been noticeable changes with the type of vessels being used and the maritime routes taken by smugglers to enter The Bahamas (Photo 1 - Illicit Maritime Routes). In addition to using traditional sailing sloops, smugglers are now using conventional sailing yachts, as well as motorized boats that make it more difficult to detect them (Photos 3- Haitian Vessels). To improve their chances of evading authorities, smugglers are also networking with locals in the islands. The thing that has not changed over many years is the improvement of border controls at the source country (the Republic of Haiti), which itself is challenged by a vast coastline and limited national resources to secure it (Photo 4 and 5 - Map of Haiti & Photo of Port au Paix). Thus, smugglers are able to operate freely at home, while placing more security demands on neighboring countries or territories such as The Bahamas and the Turks and Caicos Islands. As the Defence Force makes headway in shutting down main smuggling routes, human smugglers naturally shift to new or alternative routes. With this balloon effect in play, common smuggling routes or access points now include the traditional northward passage, as well as additional maritime corridors in the southern Bahamas. These access points exist from as far east as the Turks and Caicos Islands to as far west as Cay Lobos (on the ocean's edge south of Andros Island). This southern gateway spans a distance of over 300 nautical miles (nm) making it possible for smugglers to by-pass Defence Force and US law enforcement assets operating in the south. A classic example of how trends and patterns have changed over the years is seen in the matter involving the vessel that recently sank in waters off central Abaco on Saturday 2 February 2019. 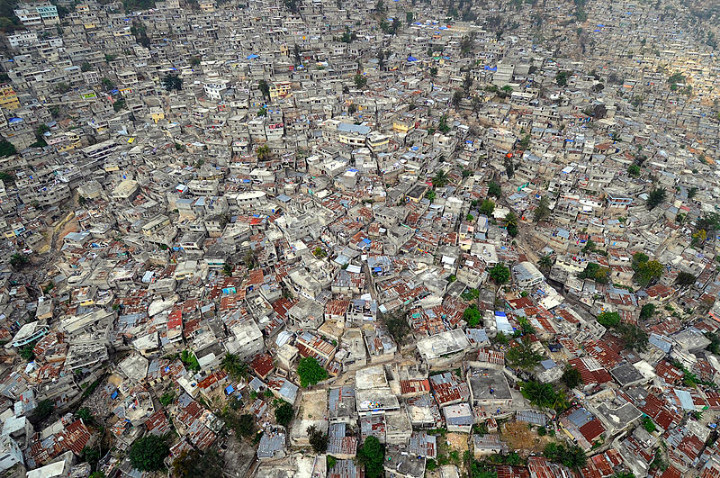 This tragic incident resulted in the loss of over 30 Haitian nationals. Their vessel struck a reef six miles off mainland Abaco and sank. It was not one of the traditional wooden sloops normally used for smuggling, but rather a modern 40-foot sailing yacht commonly used by hundreds of visitors to The Bahamas making it difficult for authorities to distinguish it as a human smuggling vessel. Additionally, the passage taken by this vessel could have very well been an irregular one off the eastern coast of our islands in the Atlantic Ocean. Another example of changing trends is the influx of undocumented migrants being smuggled into the Turks and Caicos Islands. This British Overseas Territory at the southeastern end of The Bahama Island chain is extremely challenged by smugglers of Haitian nationals. With a tiny population of over 30,000 people, landings of undocumented migrants on these islands have been occurring more frequently with smugglers using traditional sloops, as well as motorized vessels with outboard engines. 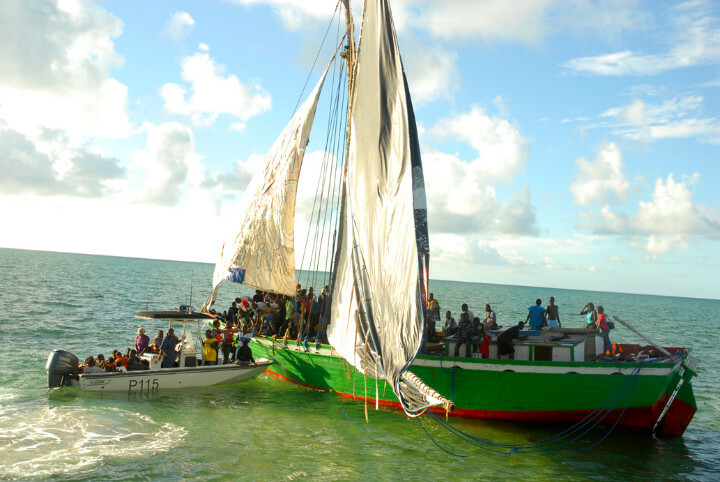 Also, in January of this year, Cuban authorities intercepted a Haitian sloop with over 90 persons on board. This vessel was more than likely making its way westward along the Cuban coast with the hope of avoiding detection by Operation Bahamas Turks and Caicos (OPBAT) helicopters based in Inagua, US Coast Guard vessels patrolling the Windward Passage area near Haiti, and Defence Force patrol craft stationed in the south before heading northward anywhere along the extensive maritime boundary line between The Bahamas and Cuba. Although the Defence Force conducts patrols on short rotations in the southern Bahamas as part of its short term strategy, the organization is simultaneously unfolding its decentralization program through a multi-layered security approach with a collaborative approach for a sustaines and more effective effort. (Photo 6 - Map of Regional Command areas). Presently, most Defence Force operations originate out of Coral Harbour Base in New Providence. Located in the north-central Bahamas, this base is over 300 nm from Inagua in the south and approximately 150 nm from the top of the Abaco chain in the north. 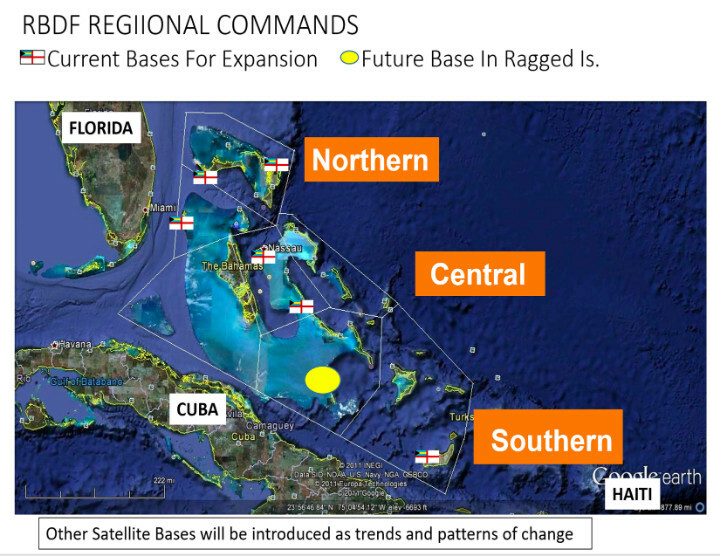 New Providence-centric operations are time-consuming, ineffective and create much unnecessary wear and tear on ships and personnel for operations in the southern or northern Bahamas. The Defence Force's decentralization program, therefore, requires the establishment of regional commands with fully operational bases at strategic locations in these areas over the next five years. The decentralization program is designed to sustain the Defence Force's presence at strategic locations throughout The Bahamas. The program will also reduce maintenance requirements on Defence Force ships and machinery, as well as limit undue stress on ships' personnel when on 24/7 patrol assignments. The nine ships that were acquired and the three major harbours yhat were dredged under the $232 million dollar Sandy Bottom Project during the period 2014 - 2017 constituted the first phase of the Defence Force's decentralization program. The second and third phases of the decentralization program consists of the establishment of bases and the acquisition of detection and tracking technologies for the effective and efficient policing of Bahamian borders. 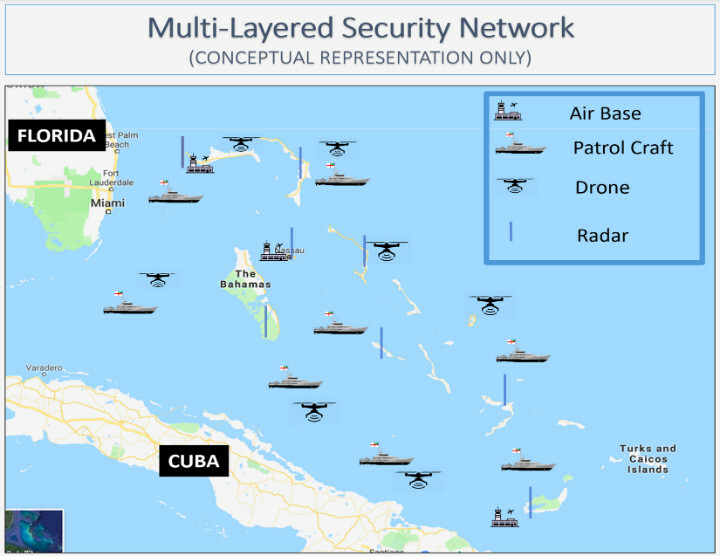 These bases are needed to sustain the operations of ships and aircraft at strategic locations such as Inagua and Ragged Islands in the south, while detection technologies are instslled to enhance the efficiency of these operations. Unlike land patrols that have clearly defined boundaries with limited options for escape by criminals, the open sea has no limits. 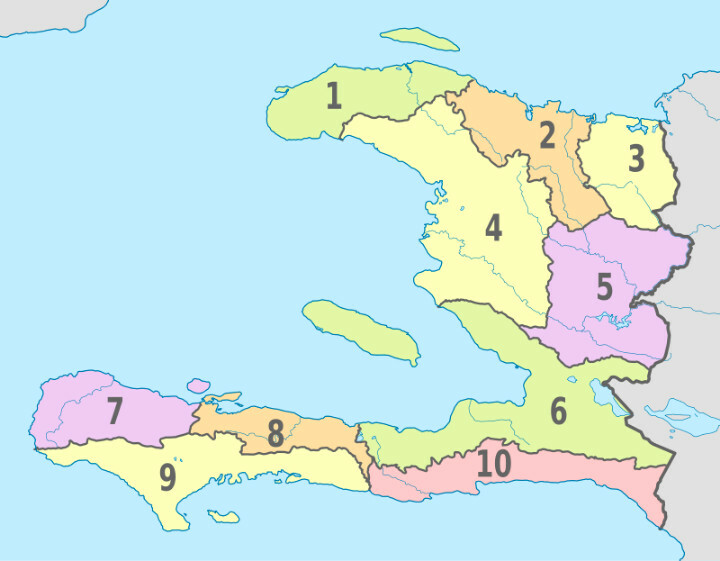 The vastness of The Bahamas maritime domain is severely underestimated by many (Photo 7 - Map of The Bahamas and the Eastern Caribbean). Take for example, how small the area just south of New Providence looks on a map. 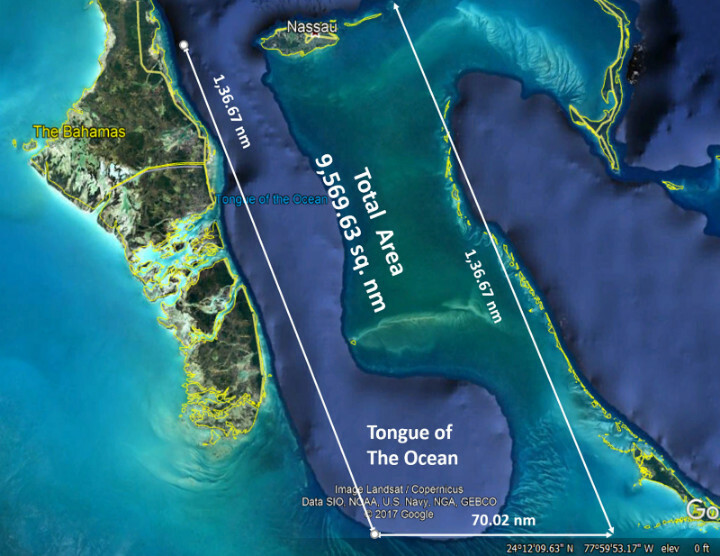 Often plied by Haitian sloops, this north-central area of the Great Bahama Bank is bounded by the Exuma Chain to the east, the Tongue of the Ocean to the west, and Green Cay near the southern end of the Tongue of the Ocean (Photo 8 - Map of Area of Tongue of the Ocean). In reality, this area alone covers over 9,000 square nautical miles of water. Compared to the 21-by-7-mile-wide New Providence Island where more than 70 percent of the nation's population resides, this very small portion of the Great Bahama Bank is about 100 larger in size. The average distance at which a low lying vessel, and in particular, a Haitian sloop can be seen on a clear day is approximately 3 to 7 miles with the naked eye during daylight hours. (Even regular marine radars are limited in detecting wooden Haitian sloops from a distance). In a very general sense, it would take several ships to maintain an effective watch over the 300 nm stretch of water between the Turks and Caicos Islands and Cay Lobos. Patrol effectiveness are all the more diminished during nighttime operations when smugglers travel most. A recent example of the difficulty in detecting and tracking a human smuggling vessel is found when a patrol craft, a US Coast Guard Cutter, an OPBAT aircraft, and a police aircraft were deployed over several days to find a Haitian sloop that was initially sighted almost 200 nm southeast of New Provodence. In the end, the sloop was spotted by an OPBAT aircraft and intercepted by a Defence Force patrol craft on Sunday 16 February 2019 approximately 40 nm south of New Providence on the Great Bahama Bank. The absence of adequate bases and patrol craft aided by appropriate detection and tracking technologies paints the picture of looking for a needle in the proverbial 'haystack' when searching for targets of interest. Without such technologies, more ships and personnel will be needed to keep a coastal watch on land and at sea with increased wear and tear on assets and personnel. No single asset or detection equipment is going to solve today's challenges. Each asset or equipment has its strengths and limitations; yet, their contributions are complementary to the success of effective border security. For example, the suspect vessel that a radar might fail to detect, might be located by a drone or an aircraft. The use of detection and tracking equipment is not a cure-all'; however, when used in a multi-layered approach, such technologies would enhance the chances of detecting and tracking illicit activities within The Bahamas' maritime domain. An effective decentralization program should therefore incorporate a multi-layered security approach consisting of ships, aircraft, radars, drones, Automated Identification Systems (AIS), Forward Looking Infra-Red Cameras, CCTVs, space satellites, and other detection equipment to enhance operational effectiveness. Already, a coastal radar has been installed in Inagua inclusive of AIS equipment. It is the first in a series of coastal radars to be installed along our chain of islands with the financial support of the United States government. The US government has also funded a multi-million dollar communications equipment package that is being installed to improve Defence Force air, land and sea communications. Additionally, proposals have been received by the Ministry of Finance for the implementation of a multi-agency drone program that will consist of long and short-range drones to be managed by the Ministry of National Security. Furthermore, no single agency can roll back the tide of illicit activities. Interagency cooperation has been the mantra of the Minister of National Security, the Honourable Marvin Dames, ever since taking office in 2017. In further strengthening its resolve to prevent, monitor, detect, deter and/or apprehend those who violate our maritime laws, the RBDF continues to engage in collaborative efforts with its regional partners--the US, the Turks and Caicos Islands, the Republic of Cuba, and Jamaica--in the areas of information sharing and security cooperation with favourable results. The Defence Force also looks forward to engaging in security cooperation dialogue with its counterparts in the Republic of Haiti and the Dominican Republic through the office of the Ministry of Foreign Affairs. Undoubtedly, the way ahead requires significant investment, which is being addressed. In view of multiple maritime challenges confronting The Bahamas, the Defence Force is shifting from a reactionary approach towards the phased implementation of its decentralization program for the effective policing of borders of The Bahamas. In the interim, the dedicated, hard-working men and women of the Defence Force will continue to adjust and adapt their mode of operating to overcome human smuggling and other illegal activities in collaboration with local and regiomal partners while the goal of decentralization is being realized.